This is an original drawing created as a gift for a studio ink and paint artist created by an animator at the Warner Bros. Studios in the 1940s. This original graphite drawing features a comical caricature of the ink and painter traveling with her luggage rather than in a passenger compartment. It appears to be a gift when she left the studio, and there are notations next to some of the other women in the drawing stating who they are as well. 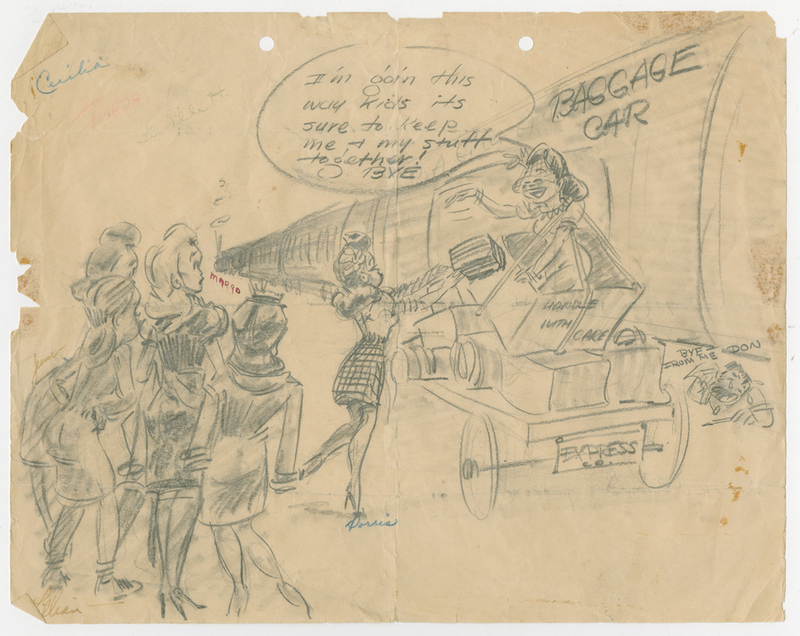 This drawing was created by studio animator, Don Williams, as he was a friend of the ink and painter and also drew himself saying goodbye to the right of her image on the luggage cart. Williams worked for WB but also went on to be a famed animator and performer with Walt Disney Studios, where he also became an original Mouseketeer on the original Mickey Mouse Club. The overall measurements of the piece are 9.5" x 12" and the image itself measures 9.5" x 12".